Want to try writing using only simple words? Here’s a writing checker you can use: xkcd.com/simplewriter. To help me write the words in my Up Goer Five picture, I taught my computer to watch my writing and tell me when one of the words I used wasn’t in the top ten hundred. After I put up my Up Goer picture, other people made things to check writing, too (like this one). When I decided to write Thing Explainer, I went back to the writing checker I had used and made it better. Now, I’m happy to be able to share it with everyone! A note on the words: Some words are used more often in certain kinds of writing and talking than in others, which means different ways of counting words will give different answers for which ones we use the most. The set of ten hundred words in Thing Explainer comes from putting together many ways of counting how much people use a word to come up with a single set of ten hundred words that should sound familiar and simple to lots of people. Thank you to James Zetlen, who helped make the word checker work on other people’s computers and not just mine. I’m going on a book trip! I made a book that explains things. It’s called Thing Explainer. It will be out soon! It’s a big flat book full of pictures of things with lots of parts. There are also little words that tell you what all the parts do. You can read more about it here! When my book comes out in two months, I’m going to visit a lot of places with it! I’m going to New York, Seattle and Portland, San Francisco and Berkeley, Houston, Chicago and Naperville, and Toronto. If you live near one of those cities, maybe you can come see me! In each city I visit, I’ll be standing in a big room and talking to people. I’ll also be writing my name in people’s books, but only if they want me to. Note: A limited number of wristbands and seats will be available to those who provide proof of purchase of Thing Explainer from a Barnes & Noble retail location or BN.COM. For details, click here. Tickets: $5 includes admission. Seating is limited. A portion of proceeds from ticket sales will be donated to Zeno: Math Powered. To purchase tickets and for details, click here. Note: Book signing only. Purchase of Thing Explainer from Powell’s is required for admission. Space is limited. For details, click here. Tickets: $35 includes one book and admission. Seating is limited. To purchase tickets and for details, click here. Tickets: Free with the price of admission to Space Center Houston. Seating is limited to those who RSVP here. To purchase tickets and for more information about Space Center Houston, click here. Tickets: Free, but required for admission. Seating is limited. To get tickets and details from Anderson’s Bookshop, click here. Tickets: $43 includes one book and admission. Seating is limited. To purchase tickets and for details, click here. Tickets: $40 includes one book and admission. Seating is limited. To purchase tickets and for details, click here. Can’t make any of these events, but still want a signed copy? 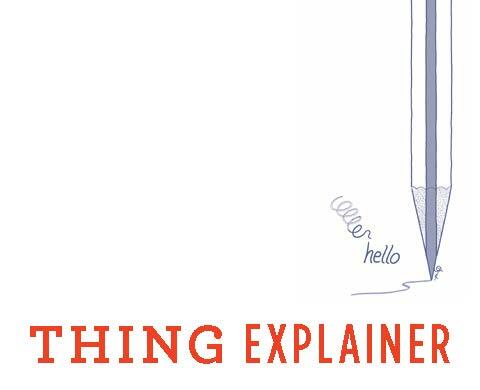 A limited quantity of signed Thing Explainers are available to pre-order from Harvard Bookstore, Porter Square Books, and Brookline Booksmith.